Manufacturers that have successfully transitioned to automated, highly-efficient processes certainly did not make these investments without giving careful thought to their supply chains and their ability to seamlessly move both supplies and finished goods. How, for example, would increased automation affect the speed at which supplies were needed? Would additional parts inventory be needed, and if so, at what cost? And what if a piece of machinery broke down? What would be the plan for quickly having a replacement part available to avert any production delays? A manufacturer that has invested in automating equipment and production processes must extend that same appreciation for technology to its supply chain. And its most important investment will be in an integrated system that connects every phase of the process – warehouse/inventory, distribution, transportation, and back office functions – as a way to gain supply chain visibility. the associated cost and storage issues. Today’s technology-driven world allows manufacturers seemingly infinite access to data points about virtually every aspect of the manufacturing process, consumer behavior, product design, marketing trends, weather patterns, and any other factor that could remotely affect sales. The trick is to zero in on those data points that are most relevant and drill down to the underlying messages the data holds. In certain industries – electronics and semiconductors, for example – manufacturers are under constant pressure to shave days – months – from their lead times. Manufacturers unable to keep pace are getting left behind. As analysis by Accenture consulting notes, “…chip companies that can deliver on materially shorter lead times will command higher average selling prices than their potentially technically superior competitors, because early market share capture of consumer devices is exceptionally valuable.” For these industries, speed to market is not only a competitive issue but also an economic necessity, since products in these categories generally become obsolete quickly, as “better/faster” products are routinely introduced. As a result, a growing number of manufacturers are turning to expedited services as their preferred logistics solution. Whereas expedited service was once reserved only for extremely urgent or fragile shipments because of its higher costs, today’s manufacturers are finding the higher levels of service and customer satisfaction more than justify the cost. • Globalization/Customs Issues. 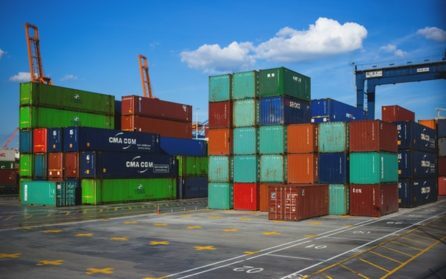 U.S. manufacturers are engaged with international partners and buyers, and they must have seamless, efficient processes both for receiving imported supplies and for shipping finished goods to international markets. To illustrate this point, the New York Times referred to Apple’s iPhone as “a collection of intricate parts that are made around the world and assembled in China.” The same can be said about a multitude of products manufactured in the United States. Production of a Ford F-150 pickup truck, for example, relies on Mexico for 15 percent of its parts, while Chevrolet’s Silverado relies on foreign suppliers for more than half of its parts, including, as CNN reports, a Mexican-built engine. Manufacturers must have full confidence that imported parts will arrive on time, with no unexpected border delays, and that exported shipments will arrive as promised, regardless of their international destination. The Boeing 737 is assembled just outside of Seattle, Washington, where hundreds of suppliers provide the 367,000 parts necessary to make each aircraft. Not surprisingly, the manufacturer places enormous pressure on its suppliers for precision-like deliveries to reduce costs and for continuous product innovation. With that many parts to manage, Boeing ensures production efficiency by relying on preassembled “kits” to guide workers through their day. According to NBC News, “Instead of spending an hour or two assembling the equipment they need for the day, Boeing factory workers now arrive at work to find a kit containing all the screws, hammers, and other instruments they will need to get their specific jobs done.” But ensuring that every kit has the necessary components can require herculean efforts. If one supplier misses a delivery and a stock out occurs, the impact can reverberate throughout the entire assembly line. For example, the Financial Times reported that United Technologies, owner of aircraft engine manufacturer Pratt & Whitney, has stated that roughly 44 percent of its suppliers do not deliver on time. inventory at a facility located near the manufacturing facility, disposes of all packaging, and ensures that each worker has the precise tools – presented in the exact order in which they will be needed – to perform that day’s work. Many manufacturers have heeded customer expectations and added eCommerce and omni-channel capabilities. The “2016 Manufacturing & Distribution Sales and Technology Survey,” sponsored by Handshake technology provider, found 44 percent of manufacturers and distributors surveyed already have an eCommerce platform in place to allow online ordering. Of those, 63 percent also allow orders from a mobile device, and 21 percent say more than a quarter of their B2B revenue is generated via online channels. Successful manufacturers have taken the time to carefully research their customers’ eCommerce expectations and have built platforms that provide high-quality transactions. This, of course, involves consideration of inventory, fulfillment, technology, distribution, returns management, and transportation issues beyond the manufacturers’ existing scope of activity. backend functions such as recordkeeping and compliance. A comprehensive provider will also implement a reverse logistics strategy to process the roughly 8 percent of sales that will be returned. When athletic footwear manufacturer Adidas announced plans to open its first U.S. production facility in metro Atlanta, GA, the company cited the region’s strong transportation infrastructure as one of the determining factors. As that city’s regional economic development commission points out, businesses located in the Atlanta area benefit from proximity to Hartsfield Jackson International Airport, three major interstate highway systems, an extensive rail system, and proximity to the Port of Savannah. Route Optimization. Among the many positive contributions technology has made to the freight/logistics industry, the concept of route optimization has been among the most beneficial. Route optimization software helps companies better manage their distribution networks through the use of advanced algorithms. The process calculates the most efficient service option, maps out direct routes, and matches available trucks and drivers to make the delivery. In doing so, delivery routes become much more streamlined, meaning reduced mileage and lower fuel costs. Consider the benefits achieved by Coca-Cola Enterprises when it employed route optimization software to help manage delivery of more than 1.5 billion cases of CocaCola beverage products throughout North America and parts of Europe. By developing advanced algorithms that took into account everything from local traffic patterns, driver working hours, infrastructure, and fleet availability, the company was able to achieve $45 million in annual cost savings. While most businesses do not operate on the same scale as Coca-Cola, the concept of technology-driven route optimization applies to businesses of all sizes. Distribution Center Bypass (DC Bypass). Until recently a 2- to 3-day stopover was “baked in” to a standard distribution plan, regardless of whether or not it was needed. According to Supply Chain Digest, in some cases, a shipment was required to travel thousands of miles out of the way to make a distribution center stopover, only to make a return trip back to the vicinity of its starting point. In recent years, businesses and logistics providers have realized the enormous waste in this arrangement. Instead, companies have opted to open regional distribution centers to accommodate local needs or have streamlined routes so that shipments can travel directly to their end destination. DC bypass can eliminate 7-14 days from the supply chain, which represents a significant amount of inventory that can be taken out of the system. The shortened distribution cycle is a lifeline for businesses trying to rush products to market and for those simply trying to control costs and better manage transportation spend. Consolidation. Consolidation is a highly efficient way to control transportation costs – and costs associated with any international border clearances. By consolidating smaller shipments into one larger unit, more favorable rate terms may apply. Essentially more expensive less-than-truckload shipments are converted to full truckloads, and in the process, a company can reduce costs and provide better service to end customers. Horizontal Collaboration. Supply Chain Management Review described horizontal collaboration as companies sharing supply chain assets for mutual benefits. Businesses in the same industry, that often have the same customers and same logistics needs, are prime candidates for horizontal collaboration. A current “highprofile” example involves two competitive chocolate manufacturers, the Hershey Co. and The Ferrero Group in North America. The two companies entered into an alliance to share warehousing, transportation, and distribution processes and assets. To meet the challenges of 21st century manufacturing, companies are turning to their logistics providers as never before to assume greater responsibility and develop increasingly out-of-the box, innovative solutions. Today more than ever, logistics partners have a seat at the table and a voice in helping businesses address their supply chain challenges. • Technology-Based. Technology has changed EVERYTHING when it comes to logistics and transportation solutions. As a result, providers are able to offer solutions that were unthinkable a few years ago. Make sure any potential logistics provider has not only invested in technology – and in regular upgrades – but that it has technology-savvy staff who understand the system and can ensure maximum benefit. • Wide Scope of Solutions. Are you aware that it is possible to have a ground shipment delivered to Canada faster than some transportation providers’ air solutions? This is one example of how innovative logistics providers are thinking out of the box and developing innovative solutions. Today, it is possible to have a “customized-like” solution for almost every shipment. Long gone are the days when a transportation company would offer a single “take it or leave it” approach. Choose a carrier with a menu full of options and a “sky’s the limit” approach to helping address your company’s precise needs. access to the right equipment. ongoing recommendations for service improvements. arrive at the border with all documentation pre-filed, the correct tariff classification assigned, all duties and taxes paid, and a determination of any free trade benefit eligibility. • Customer Service. Your logistics provider must take seriously your commitment to your customers. A good logistics provider will have staff dedicated to your business, who understands your objectives, and who can advise how best to meet those goals. Equally important, a customer service representative must be easily accessible should something go awry or a last-minute change become necessary. Black&Decker is certainly not alone. Other companies that have announced plans to expand in the U.S. include Ford, Carrier, Apple, General Motors, and Walmart. In addition, non-U.S. companies including Hyundai, Kia, and Foxconn have announced plans to invest in U.S. facilities. Whatever the reason, U.S. manufacturing – and the economy overall – are poised to benefit. This investment comes at a time when U.S. manufacturing output is strong, with more than 50 percent of existing companies telling the Institute for Supply Management they were expanding instead of shrinking. But integral to this new investment and growth is the fact that U.S. manufacturing looks very different today than it did before technological innovation took hold. This change has reverberated throughout each manufacturer’s supply chain and affected the way in which products are made, stored, sold, and transported. U.S. manufacturers have invested heavily in technology-based, efficiency-driven facilities. It’s essential then to entrust that investment to a high-quality, experienced logistics provider. Otherwise, today’s precision-like manufacturing processes will be one late shipment away from a serious breakdown. For the best in innovation and collaboration, choose Purolator International. We’re the experts in supply chain solutions, and we have the technology to meet the modern needs of manufacturing. Contact us today to discuss our future partnership – we look forward to hearing from you!